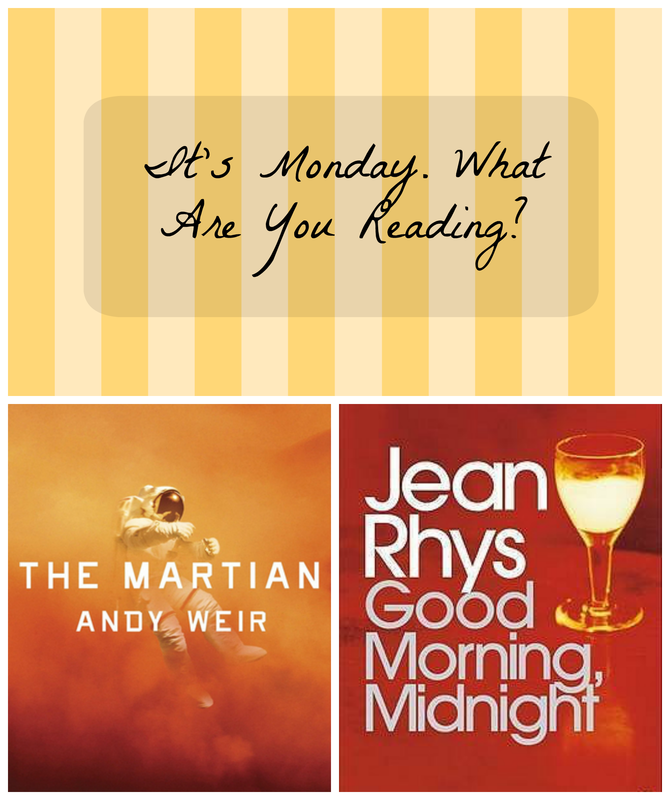 Monday again, and this morning I’m gulping coffee and reading my train book, The Martian by Andy Weir. I heard so much about this last year, but never got to it, partly because I thought it would be too science-y, which isn’t really my thing. But it’s been pleasantly surprising to me how much I’ve enjoyed it so far. Mark Watney is so smart and resourceful, but Andy Weir himself if also genius level smart, so I guess that’s not too surprising. My Lit Seminar is on its 4th book so far, and it’s Jean Rhys’s Good Morning, Midnight. The theme of the class is “wandering modernism,” but in my opinion it’s just “sad books.” This one is set in Paris, and even though it’s supposed to be sad, I have high hopes just from the setting alone. I want to read more than I did in February this month, and not just for school. Spring break is in a few weeks so that should give me some more time. I’m definitely looking forward to reading some Stephen King for the King’s March event hosted by Rory at Fourth Street Review and Wendy at Wensend: I have Pet Sematary out and ready to scare me to death, and I’m debating a Stephen King audiobook too. There are still 11 people ahead of me in line for The Martian, but I can’t wait to read it. I’m trying to not get too excited because I don’t want to be disappointed after being pulled in by all the hype. But still, I’m ready to read it. I DNF’ed The Martian a few months ago, but I keep seeing more and more positive things about it! I might have to give it another go. If you didn’t get very far, I would say try again! I was about to put it down myself in the beginning because I was so annoyed with the assumption that EVERYONE is a scientist, but after you get a better feeling of his personality it gets a lot better. I just kept thinking, how could anyone be so smart?? There were a couple of things that annoyed me about The Martian, but mostly I really enjoyed it! Me too! Like everything that happens he has a solution for. It’s a little unrealistic, but given that he’s on Mars to begin with, I can’t be too surprised at that! I had a chuckle that you think the theme is really just “sad books” – that’s probably a lot more accurate. I didn’t sleep well last night so I had to put my book away this morning. Just too tired! Shame because even though I just started it, I’m really enjoying The Word Exchange! It’s sad but true! I just bought The Word Exchange the other day; I’m glad you’re liking it already! I’m DYING to read “The Martian” and am going to make that happen ASAP! Science fiction is usually not something I like at all, but this is really great, I hope you like it! I was apprehensive about The Martian for the same reasons you were and ended up loving it! The science was a bit heavy at the beginning, but Watney’s awesome personality really helped things along and the science got much easier as the book went on. I giggled at “wandering modernism” just being “sad books.” I read plenty of sad books, so it definitely isn’t a dealbreaker for me. I hope you like your new one!